Actuator and Gantry systems do not get allergies but they are frequently affected by seasonal changes related to the surrounding environment. Changes from cooling to the heating season can cause your actuators to start making odd noises. Often this is attributed to lower relative humidity levels and drying environments. In dry conditions, the belt becomes slightly stiffer and as the belt tooth enters the pulley you may hear a clicking sound like a zipper opening and closing. If the speed of the actuator is fast or slow this sound may change pitch and amplify when the actuator nears the pulley assembly since there is less belt at the ends of the stroke. A noisy actuator transmits sound through the actuator beams and each profile geometry will have an influence. Unfortunately, we do not tune our extrusions to produce pleasing notes. Generally, a noisy actuator does not indicate an actual problem. It is caused by the friction between the urethane belt and the nickel plated pulley surfaces as they rub together during engagement causing a squeak just like your new sneaks on a gym floor . We understand that a noisy actuator is obnoxious so we recommend the application of a lightweight oil or squirt of WD-40 to the tooth side of the belt. Just a small amount will decrease the undesired noises. What’s that the red stain on my actuator? Is this a maintenance issue? If you’re seeing a red stain on your actuator, don’t worry. Your machine is just exhibiting a natural phenomenon caused by friction called tribocorrosion. Sounds nasty, but this is a common occurrence in manufacturing environments that can be solved with proper actuator maintenance. Tribology is the science of friction, wear, and lubrication. Corrosion is the electrochemical, chemical and mechanical interaction between metals and the environment. Together they form tribocorrosion. 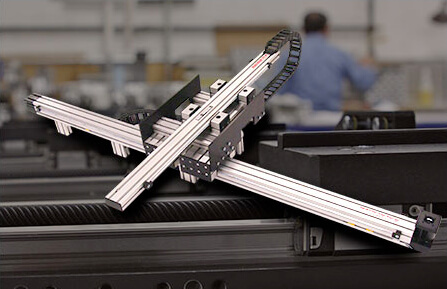 In order to accurately guide a linear cart in an actuator to translate rotating motor motion into linear motion or travel, two surfaces must come in contact. 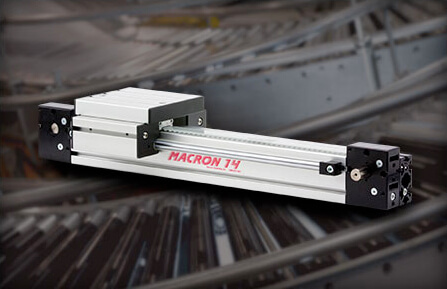 Macron uses multiple types of linear guidance systems depending on accuracy and load requirements of the work. The simplest is a plastic block running in an aluminum channel. This type of guide is not subject to corrosion. Our workhorse method uses a “track roller” riding on a round chrome plated rail. 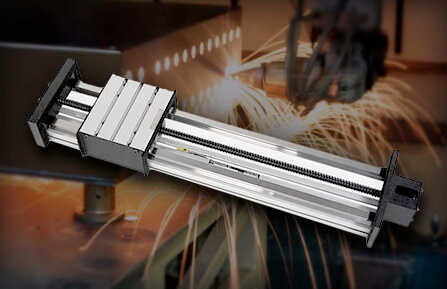 A third method is a linear bearing riding on a precision ground profile rail. The latter two methods have steel materials and as we all know steel will rust when exposed to oxygen. To minimize corrosion, steel is often plated to create a barrier to minimize the chemical interaction between the iron and oxygen elements. Steel can also be heat treated to harden the material and reduce wear. In both “track roller” and “linear bearing” systems a combination of plating and hardening is present but even with these two preventative measures oxidation will result. At a microscopic level, all surfaces look like a mountain range of peaks and valleys. As two surfaces come in contact under pressure (necessary to provide accurate guidance) friction results and the tops of the peaks erode and break free microscopically. These microscopic particles of steel instantly oxidize or rust naturally. Since plating and hardening do not solve this problem a third element must be introduced and that is lubrication. For actuator maintenance, adding lubrication provides a slick layer between the rubbing metal surfaces reducing friction and the erosion of microscopic particles and thus significantly reducing oxidation and rust staining. So your nasty case of trobocorrosion is easily treated with a dose of lubrication. Track roller systems have built-in felt wipers that continuously apply a thin film of oil onto the round rail surface. These felt wipers will dry out over time and require refilling with a light 10 weight mineral oil or in abrasive environments regular replacement of the felts. 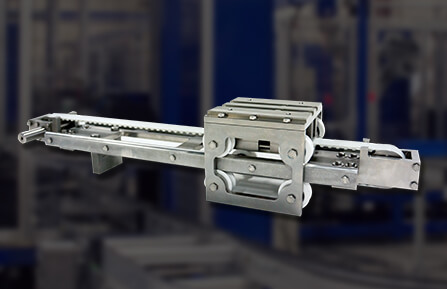 Linear bearing systems have a grease filled chamber that is sealed to prevent lubricant escape or contaminant entry. Depending on the duty cycle of the system additional grease should be added to ensure long life. For more information about lubrication method, frequency or parts contact a Macron representative or download our User Guide for Maintenance.